Since I was young I have loved marine creatures. I distinctly remember a book I bought from the National Aquarium in Baltimore (which I’m pretty sure was just the Baltimore Aquarium when I bought this book) that I would spend hours on end flipping through. I loved the days in any science class that we watched films on the ocean and everything in it. And who can forget the iconic scene from Finding Nemo when Dory’s squishy tried to eat her? This brings me to a specific kind of marine animal, those that are bioluminescent. According to Discover Magazine online, many of these creatures light up the dark in order to attract prey, attract mates, or as a defense against predators. 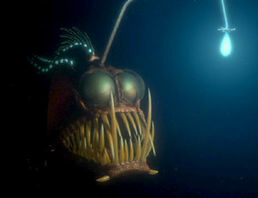 In one of the various images this site provides it talks about the deep-sea shrimp. This amazing animal releases a “glowing blue ooze” when faced with a predator that stuns it and gives the shrimp times to escape. The tropical mantis shrimp use their bright eyes to communicate with their own species; those of its own species can only detect the light given off. How these animals light up is due to a chemical reaction. I read up about this on ocean.si.edu. Also this site explains that these creatures can control when and sometimes the degree to which they illuminate. This was news to me! Bioluminescence is even found in some sharks, as well as bacteria, algae, jellyfish, worms, and sea stars. I wish I found more information on studies of these fascinating creatures. What we know of them could be completely wrong, yet this is what the public believes and much of the scientific community. This entry was posted in Uncategorized on October 5, 2015 by Maddie Panzeri. So those little bundles of joy catch everyone off guard right? Ehhhh, well they shouldn’t, completely. How you live and your environment will affect the chance of a mother having twins. 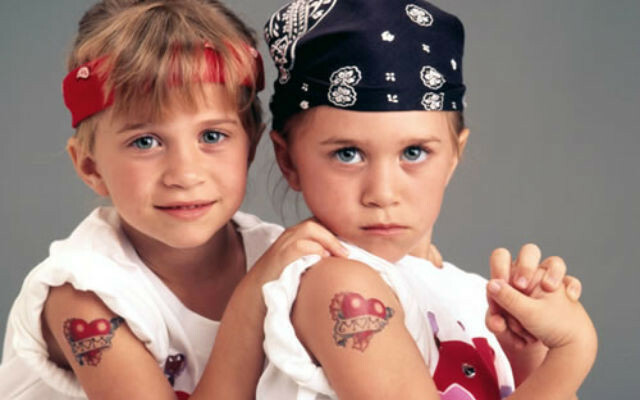 Most people know that there are two types of twins identical-the same egg that splits and fraternal-two eggs fertilized at the same time (essentially siblings). One big factor of the increasing-yes increasing-rate of twins is drumroll-SOCIETY. As women get older their bodies tend to release more eggs as a kind of last-ditch effort to pass on their genetic code. No lie. According to babycenter.com. “As you get older, hormonal changes make it more likely that your body will release more than one egg at a time. And more than one fertilized egg often means more than one baby.” So as women are waiting longer and longer to have babies, they are actually having more multiple births than women of the past have. Age is not the only factor. ARSM Patient Education Booklet also said these same things and touches on the dangers of multiple pregnancies. Women with multiple pregnancies must be closely monitored and given special prenatal care and caution before and after birth. Learning disabilities are also a consequence of multiple births. “The California Autism Twins Study suggests environmental influences, which could include parental age, low birth weight, multiple births, and maternal infections during pregnancy may greatly increase risk for ASD.” Autism Speaks .org So multiple births can lead to Autism Spectrum Disorder. The important finding was that “Because the prenatal environment and early postnatal environment are shared between twins, it is believed that at least some of the environmental factors affecting susceptibility to autism exert their effect during these critical periods of life.” My HDFS classes focus a lot on how even though we are predisposition with genetics to everything from likes and dislikes to a fatal disease, how we are raised and where can impact out lives profoundly; especially in early life. We are born as helpless infants, brought too early into this world our mind grows and develops outside the womb dramatically. This development is crucial to our future- how often your mother holds you or how she feeds you can affect your later relationships-look up infant attachment. The rising prevalence of IVF (in vitro fertilization) also leads to multiple pregnancies especially no that methods are almost guaranteed to take. Many people overestimate how many embryos are necessary and end up with multiple pregnancies. WE must take advances in science and medicine into account to prevent unwanted multiple pregnancies. Desperation leads to carelessness. The autisms spectrum disorder study is still in an early phase and must be seen as such. Unknown confounding variables will most likely play a part. So it is impossible to say for sure, though they have a solid foundation to build upon. This entry was posted in Uncategorized on September 27, 2015 by Maddie Panzeri. Wisdom Teeth: Is Removal Needed? Like many teenagers my age, I am planning to have my wisdom teeth removed. Although my dentist assured me that I didn’t have to have it done immediately, he recommended sooner rather than later. Of course I put it off, until a later break, instead of ruining a few days of my precious summer. This, and countless entertaining videos of friends and strangers delirious under the influence of pain meds, got me thinking about why we have these seemingly useless teeth. Why do we need our wisdom teeth removed? Can we live without having them removed? WHEN the heck did people even start having their wisdom teeth removed? I did some research to settle the score. This brings me back my question of if people NEED to have their wisdom teeth removed. Is it all just a scam by dentists? As it turns out webmd does not only convince you you’re dying. Although webmd.com states that 60% of wisdom teeth removal procedures are not necessary, the site continues on to outline dangers of not having your wisdom teeth removed. After all of this, I would personally recommend listening to your dentist. Is periodontal disease really worth it? Leaving your wisdom teeth in your jaw can lead to discomfort and unnecessary pain. If I could improve this research I would consider confounding variables that could impact how wisdom teeth grow in a person’s jaw and the seriousness of various cases. An article on the Duke Medicine blog, published on August 27, 2013, explains that people with light colored eyes are more affected by photophobia because they have less pigment in the three layers of the eye. Photophobia is a sensitivity to light. An ophthalmologist at Duke, Anupama Horne, MD says that photophobia does not cause loss of vision. 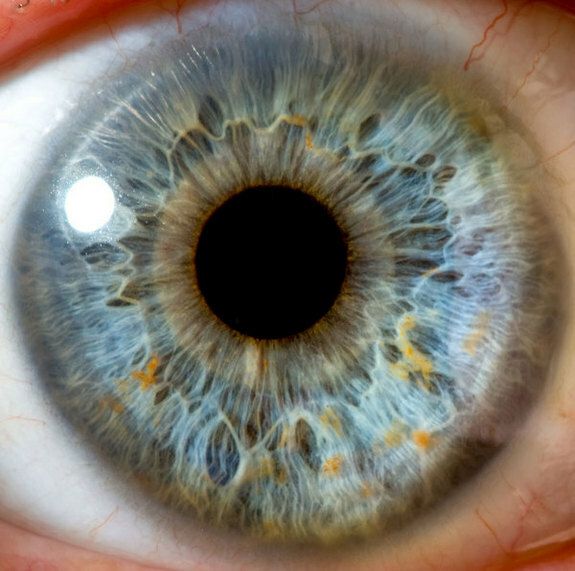 A website called Science Q&A goes on to explain that a lighter iris allows more light into the retina. The website also includes the interesting fact that blue and green eye color is caused by a lack of pigment (melanin) not a different color of pigment. This lack of pigment creates the refraction of light called Rayleigh scattering that is the same process that causes the sky to be blue. Science Q&A explains that people with brown eyes have more melanin which provides a, “…protective filter that reflects the light back out of the eye.” Horne says that it is easy to protect your eyes if you do have photophobia. It seems like common sense but wear proper UV protective sunglasses and a wide brimmed hat. A condition known as Pterygium also called “surfers eye” can occur from exposure to ultraviolet light, wind, and dust. It is a benign growth of cells. Once again, the use of sunglasses with side shields that block 100% of UV rays and a wide-rimmed hat are preventative measures. So it is true that my mother’s sensitivity to light is most likely cause by her green eyes. If you have light colored eyes, make sure that you have a good pair of sunglasses and stock up on hats. Here is a cool song about eye color from the 80’s you might like. This entry was posted in Uncategorized on September 12, 2015 by Maddie Panzeri. Have You Gone Nose Blind? Have you seen the ads for the air freshener Febreze? 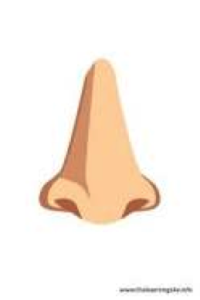 The ads suggest that we are “nose blind” to some of the smells in our own homes. That is, we don’t notice any ordinary smells in our homes, but other people do. Have you ever been away on vacation then come home and noticed a scent in your home you didn’t notice before? I have, so I wondered if the Febreze ads were correct and that nose blindness is a real phenomenon, and apparently it is. Pamela Dalton has been studying nose blindness for more than 20 years. She is a cognitive psychologist with the Monell Chemical Senses Center and she has an explanation for why we go nose blind. According to Dalton, when you introduce a new scent into your home, your odor receptors pick up the new odorant molecules and send the information to your brain’s olfactory bulb which is part of the limbic system. If the scent is understood by the brain to not be dangerous, such as a pleasant scent as opposed to a “dangerous” scent such as a fire or rotting meat, then the nose receptors shut off. 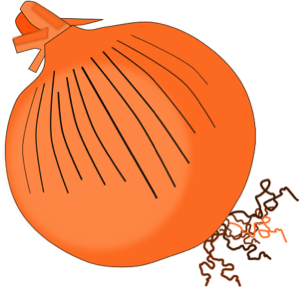 When the nose receptors shut off, the scent becomes less intense. The theory about this is that the scent is not dangerous so the brain does not need to pay attention to it. After a while you become less and less aware of the non-dangerous scents in your own home. The theory continues that this would allow you to more easily pick up on a dangerous scent if you needed to, like a bleach spill, a toaster fire, or rotting food. Dalton explains that hearing is the closest sense we have to smell that mimics how we can go nose blind. For example, those that live near a train track will eventually become accustomed to the sound of the train and not notice it anymore. That is because the brain perceives the sound as not being a threat. This is known as sensory adaptation and part of how humans adapted to their environments for survival. There are ways to overcome nose blindness. One is to exercise vigorously. This increases blood flow and helps the nose pick up on familiar smells once again. Another way is to worry more about smells. 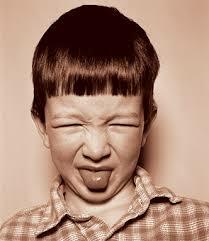 This fear regarding a smell will interfere with the sensory adaptation of smell. So if you want to know what your house, apartment or dorm room really smells like, you can: go away for a week, go do some exercise, or start to worry about the smell. When you finally figure out what your living area actually smells like to everyone else, and if it is disagreeable, you can succumb to the marketing of Febreze. How genius to market their product in such a new way! It’s not so your environment smells better for you and your family, it’s to save you and your family from the embarrassment of having a smelly home! This entry was posted in Uncategorized on September 9, 2015 by Maddie Panzeri. My aunt has a nasty case of ophthalmia nodosa. Have you never heard of this before? Well neither had I, so let me explain. My aunt loves animals, any kind of animal, so when she heard that my cousin’s friend had a pet tarantula that he was not feeding or providing water, she reached out and volunteered to take in the poor tarantula. As she said, “No animal should have to suffer, even a giant spider.” So one day she came home after being away a few days and went to check on the tarantula. It wasn’t moving and looked dead, so she put her knuckle in and nudged it a bit until it moved, relief, it was alive! She then had an itchy eye, and very unfortunately for her, she used that same knuckle to rub her eye. A few days later, her eye became inflamed and she was in extreme pain. She went to the ophthalmologist who examined her eyes with a high magnification lens and was astonished to see many tiny, minuscule hairs protruding from her eye. Around this time they figured out that the hairs must have come from the tarantula and she was suffering from ophthalmia nodosa, a reaction to the urticating hair that grow on the stomach of a tarantula. Ophthalmia nodosa is the condition of the eye reacting to vegetation or insect hair and was diagnosed as early as 1904. Urticating hairs come in four types, and type III are carried on New World tarantulas. Type III hairs are 0.1 to 1.3 mm long and have many barbs and a sharp point. They are like tiny pieces of fiberglass. In addition, the hairs are like an arrow and tend to borrow deeply into flesh and rubbing makes it worse. Type III urticating hairs can cause all levels of the eye to become inflamed. The ophthalmologist referred my aunt to a specialist who was able to remove some of the hairs, but not all as many had already worked their way into her cornea. She was treated with steroids and told that with the help of the steroids, hopefully her body would eventually dissolve all the remaining hairs. It has been several years now, and her eyesight has been damaged and she still suffers pain in her eye. It is important for people who own tarantulas, sell tarantulas or handle tarantulas to understand the dangers associated with them. All types of New World tarantulas have urticating hairs that they shoot out for defense. New World tarantulas come from North, Central and South America. Old World tarantulas do not have urticating hairs, so they tend to bite more and bite repeatedly as a defense. 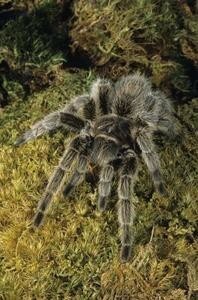 Old World tarantulas come from Africa, Asia and Australia. Experts say that when handling a tarantula, you should always wear eye protection, and one owner suggests putting a cup over the spider when you are cleaning the cage. Unfortunately, many people are not aware of the danger they are putting themselves in when they handle a New World tarantula. This entry was posted in Uncategorized on September 7, 2015 by Maddie Panzeri. There is nothing better than digging into a big bowl of fresh guacamole: avocado, tomatoes, garlic, lime juice and the more cilantro the better! So I was shocked when a family friend announced that cilantro was a disgusting herb that tasted like soap! How could she taste the same food that I find fresh and tangy and find it bland and soapy? Luckily, science has a hypothesis that may explain the cilantro divide. 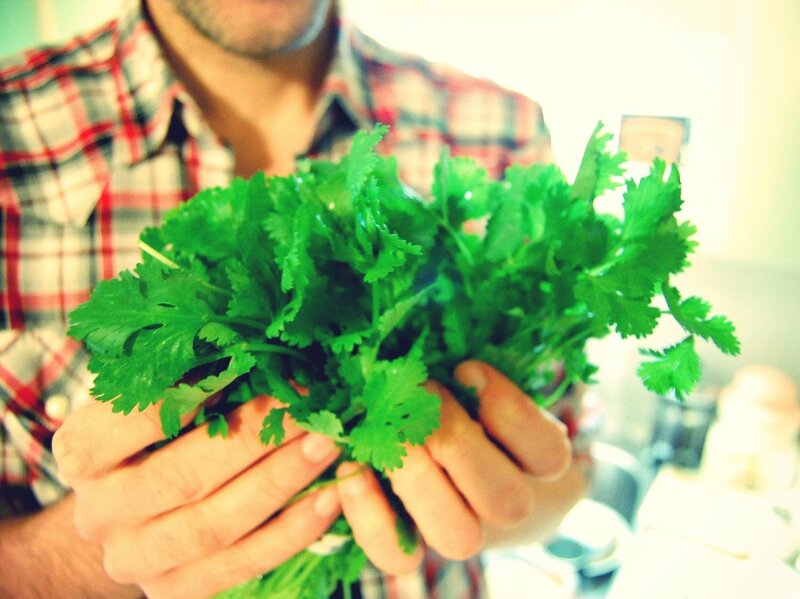 According to several scientific studies, our genes may contribute to our like or dislike of cilantro. The genetics firm 23andMe conducted a genetic study of 30,000 persons and found a link between those that hated cilantro and a olfactory receptor gene known as OR6A2. If you have the OR6A2 gene you are more likely to find the soapy smell of cilantro overpowering, and not pick up on the fresh tangy smell. This is because cilantro has a fat molecule known as aldehyde. Aldehydes are also found in soaps, lotions and some bugs. People that pick up on the aldehyde/soapy smell of cilantro will then associate it as something hazardous to eat. So I guess our genes are at work when it comes to cilantro. If you dislike cilantro though, you are in good company as Julia Child famously disliked the herb and said if cilantro was in her food she would throw it on the ground. The studies also mention that if you dislike cilantro, don’t despair, you can attempt to overcome it buy mashing it into a pesto and by being around people like me who love cilantro! This entry was posted in Uncategorized on September 6, 2015 by Maddie Panzeri. My family has a new member. He has big white teeth, lots of fur, four legs, a tail and beautiful big brown eyes! Yes, my family adopted a dog after only having cats for 15 years. It has been an amazing experience so far as Thor has adapted to our family and we have grown to love him. This got me thinking about how the process works for a dog to bond to a new family. I always just assumed that you got a dog and there was nothing more to it, but now I wonder how does a dog and its family become attached? How do you love a dog and how does it love you? A study released in the journal Science in April 2015 conducted by Japanese researchers explains why dogs like to gaze at their owners and how that gazing creates a bond between humans and their dogs. According to the study, the levels of oxytocin rose in both the owners and the dogs when they spent thirty minutes together. The urine of 30 dogs and their owners was tested after the thirty minutes. Oxytocin is a hormone that promotes social bonding. Oxytocin is also known as the love hormone. The researchers also did a second experiment in which they sprayed oxytocin into dogs nostrils which caused the female dogs to look at their owners even longer. The researchers conducted the same experiment on wolves that were pets and their owners, but found no increase in oxytocin. The scientists theorize that long ago a more friendly group of wolves bonded with humans by connecting to one of the ways humans bond with a child, by looking into their eyes, and these wolves eventually became domesticated dogs. C. Sue Carter of the Kinsey Institute at Indiana University believes the study, “makes very good sense.” In addition, previous studies have also shown that hormones are responsible in part in creating bonds between species. In observing our dog I definitely agree with this study. Thor loves to be around myself and my family members and he is always looking at us! It is hard to not look back into his big eyes and pet and praise him. When we are walking him, he often turns his head to look at us. It is amazing how something so basic such as looking at each other can build the bond between a dog and its human family. I would have been interested to see the scientists test dogs spending time and playing with people they did not know previously. Would there still be an increase in oxytocin? Would it be a smaller increase or the same? 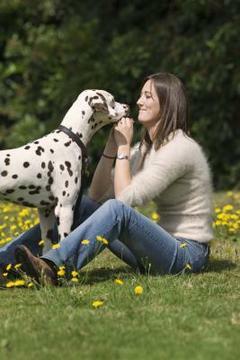 Would it be linked to the quality of interaction between the dogs and humans? So if you are lucky enough to have a dog, be sure to spend lots of time staring into his or her eyes and you will be sure to create a bond for life with your furry friend! Hi everyone, I’m Maddie Panzeri. At the moment I am in DUS although I am interested in pursuing Human Development and Family Studies. I’m from Harford County Maryland, but I somewhat recently moved to outside Pittsburgh. I was recommended to this course by my advisor but I decided to take it because it seemed like an interesting and unconventional approach to science. I have never planned on doing anything with science professionally, everything in science seemed so technical and cold to me. Although scientific topics can be interesting and engaging they have never appealed to me enough to pursue science. Science was never my ‘thing’, I spent a lot of time in my high school physics course making mini clay passengers for my lab groups ‘car’ that we used during experiments/ activities. 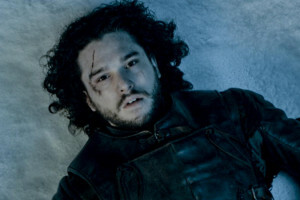 Possibly the most heart-wrenching moment of my summer was watching Jon Snow die in Game of Thrones. Also I am in love with Alessia Cara’s music, and she just leaked her own EP. This entry was posted in Uncategorized on August 26, 2015 by Maddie Panzeri.